This document lists specifications for the PXI-2720 (PXI-2720) 8-bit resistor module. All specifications are subject to change without notice. Visit ni.com/manuals for the most current specifications. Typical Specifications are specifications met by the majority of the instrument under the stated operating conditions and are tested at 23 °C ambient temperature. Typical specifications are not warranted. The following specifications are typical at 23 °C unless otherwise specified. The protection provided by the PXI-2720 can be impaired if it is used in a manner not described in this document. Channel accuracy is a function of the overall resistor accuracy, plus relay and trace path resistance, plus any effects of temperature. 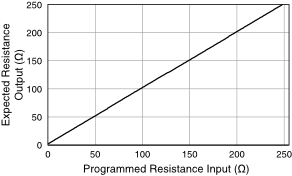 Channel resistance is a combination of relay contact resistance, trace resistance, and resistor value. 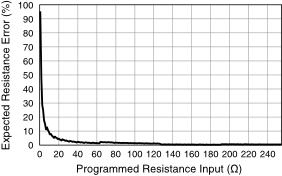 Contact resistance typically remains low for the life of a relay. At the end of relay life, the offset resistance may rapidly rise above 3 Ω. The following figures show the expected resistance error and the expected resistance. Reed relays are highly susceptible to damage caused by switching capacitive and inductive loads. Capacitive loads can cause high inrush currents, whereas inductive loads can cause high flyback voltages. The addition of appropriate resistive protection can greatly improve contact lifetime. For more information about adding protection circuitry to a capacitive load, visit ni.com/info and enter the Info Code relaylifetime. For information about inductive loads, enter the Info Code relayflyback. The relays used in the PXI-2720 are field replaceable. Refer to the NI Switches Help at ni.com/manuals for information about replacing a failed relay. The PXI-2720 can recognize trigger pulse widths that are less than 150 ns by disabling digital filtering. For information about disabling digital filtering, refer to the NI Switches Help at ni.com/manuals. NI advises against installing reed relay modules directly adjacent to an embedded controller with a magnetic hard drive because of the sensitivity of reed relays and the possibility of interference. 1 Measurement Categories CAT I and CAT O (Other) are equivalent. These test and measurement circuits are not intended for direct connection to the MAINs building installations of Measurement Categories CAT II, CAT III, or CAT IV.